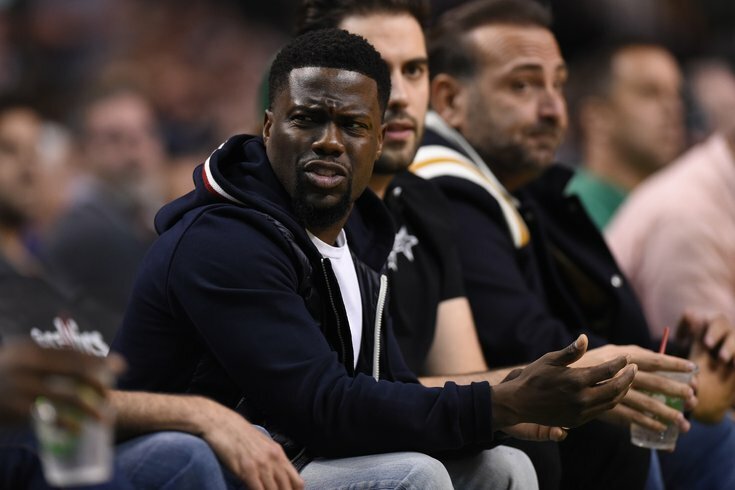 An L.A.-based street artist titled the statue "Hollow Apology"
Philly native Kevin Hart is seen here in attendance at a Philadelphia 76ers playoff game in Boston in May 2018. Hart, after reconsidering his decision not to host the 2019 Oscars amid controversy, says he will not host the award show. Kevin Hart may not show his face at the Oscars on Sunday, but it looks like that wasn't entirely his choice. On Friday a gold statue of the Philly comedian popped up right near the Dolby Theatre, where the awards ceremony will be held on Sunday, Feb. 24 at 8 p.m., looking like an Oscar and holding a pride flag. Hart initially signed on to host the 91st annual Academy Awards but later resigned after homophobic tweets resurfaced online. The Academy was apparently "blindsided" when Hart resigned and nearly refused to apologize for the tweets, saying "I've addressed this several times. ... I've spoken on it, I've said where the rights and wrongs were." He eventually *did* apologize in front of Ellen DeGeneres and has tried to move on from the situation — but not everyone has. The statue's creator, the L.A.-based street artist Plastic Jesus, titled the piece "Hollow Apology." It's sitting near the Dolby Theatre, where the event will take place on Sunday, Feb. 24 at 8 p.m.
"Over the past decades most countries have made great inroads fighting homophobia and hate, however the current divisive rhetoric seems to have taken us back to the 1970’s," the artist posted on Instagram. "So much of the Entertainment industry output comes from LGBTQ Individuals we should be celebrating it and not creating a hateful environment." Tomorrow is the Oscars so look out for the latest piece again from Plastic Jesus @plasticjesus - maybe Hollywood Blvd,maybe Weho see if you can spot it. Happy Oscars!!!! As of Sunday around 10:45 a.m., Plastic Jesus had removed the initial post from Instagram.